Bright rays of sunshine stream through the windows of the study room in the library at South Puget Sound Community College (SPSCC). Surrounded by his family, Bill Funk holds a pair of golden scissors and cuts through the navy-blue ribbon. The ribbon cutting represents the renaming of the library’s study room for Bill and his late wife Marilyn Zuckerman. 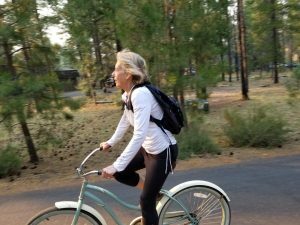 Marilyn Zuckerman loved to live life and made every moment count. The bittersweet occasion comes following the sudden passing of Marilyn last year in August. She is fondly remembered by those who knew her as a lifelong learner, and an avid reader with a passion for travel and world events. Born in Los Angeles, Marilyn moved with her first husband and children to Olympia in 1972. She took a job at Browser’s Bookshop. Later, she began working as an insurance agent for Allstate Insurance. Working at the Allstate booth inside Sears in Lacey, Marilyn and Bill met, fell in love, and married in 1990, bringing together their families. On March 14, a beautifully sunny midday, the corner of the library fills with guests for the study room dedication. The dedication represents a coming together of the community to appreciate Bill and Marilyn for their contribution to SPSCC, and a time to honor Marilyn’s life and impact on the world around her. Attendees of the event include the many members of the Funk and Zuckerman family, faculty, staff and students of SPSCC, and friends of Bill and Marilyn, including representatives from the League of Women Voters of Thurston County, where Marilyn served as president of the chapter in 2009 and continued to be involved until her death. 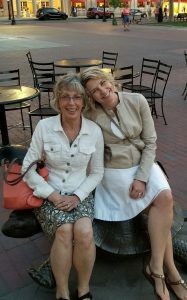 Ronelle Funk (right) remembers her stepmother, Marilyn Zuckerman (left), as someone who believed in the value of education and the importance of opportunity for others to better themselves. The Funk and Zuckerman family has been deeply connected to the SPSCC community for many years. Bill reminisces about attending SPSCC when it was still known as Olympia Technical Community College (OTCC). Bill’s daughter, and Marilyn’s stepdaughter, Ronelle Funk remembers how welcome she felt at SPSCC, and how accessible the community college was to her when she first started out. “I decided to drive up from my home in Reno to the exotic city of Olympia,” Ronelle laughs. “I walked into the admissions office of SPSCC, with five days from the start of the term, and asked what I needed to get started.” Not expecting to be able to begin immediately, with just days before the start of the term, Ronelle remembers being shocked at the simplicity of enrollment. “For $30, I was enrolled to start right away.” Ronelle later worked at SPSCC as the Director of Tech Prep (now called Dual Credit CTC) where she provided career pathways for high school students. Ronelle emphasizes that Marilyn believed greatly in community colleges because they are places that people could go to better themselves, places where the door to learning was open to all. “Grandma loved learning for the sake of learning,” remembers Renee Houljberg, her eyes misty as she smiles, thinking of Marilyn. 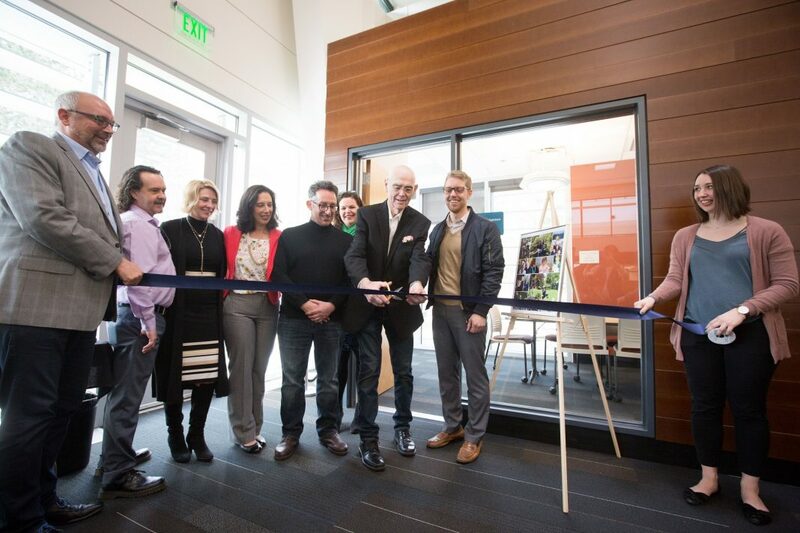 The dedication of the study room, one of four dedicated study rooms in the SPSCC library, occurs in conjunction with an endowment made to the SPSCC Foundation by Bill Funk on behalf of himself and his wife. The endowment will create a scholarship, which will be available every year to an SPSCC student in perpetuity. As the dedication winds down, the family gathers together, reminiscing and sharing memories they have with one another. They are surrounded by students in the busy library who are working towards their dreams, fulfilling their potential and working to better themselves in just the ways that Marilyn Zuckerman and Bill Funk’s gift will support for many years into the future. To visit the Marilyn Zuckerman and Bill Funk Study room, head to the SPSCC library and look for the room in the southwest corner of the building. There you can read more about Bill and Marilyn and appreciate their contribution to the SPSCC Foundation and the greater community.